Natural Blend Juice Bar & Bakery opened on Malcolm X Boulevard in late February, serving fresh juices, smoothies, and vegan dishes. BEDFORD-STUYVESANT — Get your daily dose of fresh fruits and vegetables at a new juice bar on Malcolm X Boulevard. Natural Blend Juice Bar & Bakery opened its doors at 243 Malcolm X Blvd. near Halsey Street at the end of February, according to co-owner Deonne Wallace. The spot marks the second location for the business, which set up shop eight years ago on Washington Avenue and St. Johns Place in Prospect Heights. The organic juice bar sells juices and smoothies ranging in price from $6.50 to $8.50, with choices like a vanilla espresso or pumpkin pecan spice smoothie. Customers can also stop by for coffee from Toby’s Estate. The eatery’s breakfast menu takes its influence from the brothers’ Jamaican background, with dishes like ackee and codfish with breadfruit as well as porridges. Natural Blend also offers a selection of vegan, gluten-free pastries, with all baking done on premises, Wallace added. Other menu items include stews and vegan citrus spareribs, curry chicken, and pepper steak, all made from soy. They also serve salads, soups and sandwiches. The 15-seat space features an open kitchen and the owners are looking to make the backyard available for seating and events in the coming months. “I’m very happy to be in the neighborhood,” Wallace, 38, said. “Everything that we’re doing is really out of love and to contribute to the community and bring awareness in health that will let people thrive in a better way,” Wallace said. 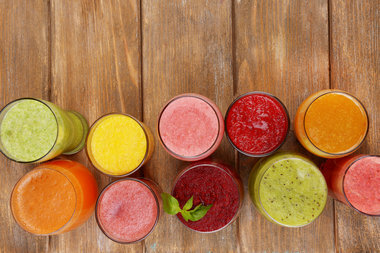 For more information about Natural Blend Juice Bar & Bakery, visit the company’s Facebook page here.